Donate to help the Refugee Action Collective get large ‘rock’ sized posters up all over Melbourne in the lead up to the federal election. 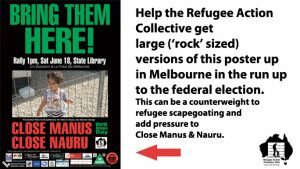 This can be a counterwieght to scapegoating of refugees and add to pressure to Close Manus & Nauru. The poster is available at the link below & will advertise the World Refugee Day rally.